Once dependent on drayage to move boxes to rail, GCT Bayonne now has near-dock rail to speed shipments to U.S. hinterland. The Port of New York and New Jersey’s newest rail facility is now in operation, offering shippers easier intermodal access out of one the region’s biggest marine terminals. The Port Jersey rail facility, which began service Monday, gives shippers who bring in containers from the Global Container Terminal’s Bayonne container terminal access to the CSX (Nasdaq: CSX) and Norfolk Southern (NYSE: NSC) rail networks. The GCT Bayonne terminal, located on a peninsula, had no direct rail service. Marine containers had to be trucked to a nearby ExpressRail facility in Elizabeth, New Jersey, or to CSX’s Kearny yard or Norfolk Southern’s Croxton yard. 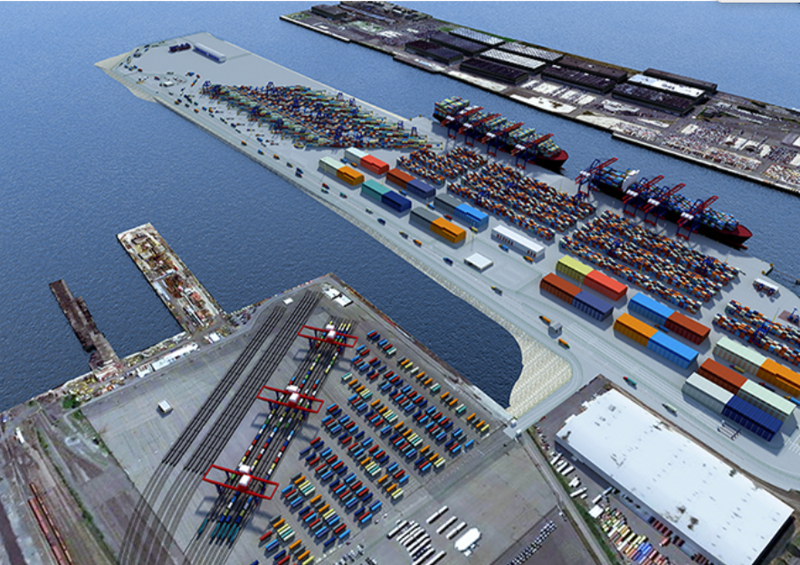 The Port Jersey intermodal facility will initially consist of four tracks designed for active loading and unloading of cargo from the GCT Bayonne terminal that connect to a lead track to and from the main freight rail network. The yard will have two all-electric rail mounted gantry cranes for loading and unloading containers. The Port announced that the facility will be fully built out by the middle of 2020 with a 9,600-feet, eight-track working pad, two lead tracks, as well as additional support and train storage track. The $149 million facility is designed to handle 250,000 container lifts annually. 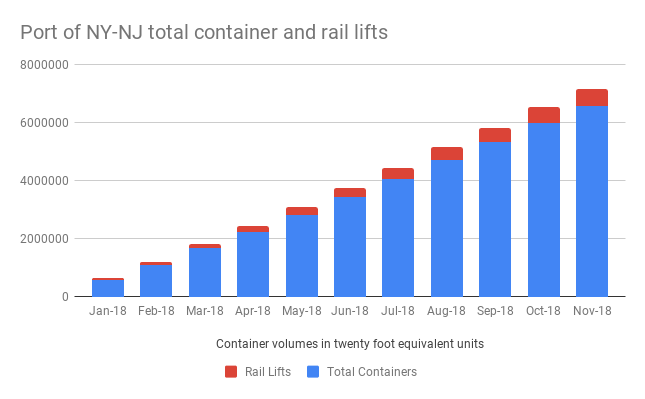 From January through November 2018, the port’s rail lifts were 593,806 containers, accounting for just about 9 percent of volumes. The Port is targeting 900,000 rail lifts annually, which it says will cut 1.5 million truck trips per year. “With more than 75 percent of the vessels arriving in the Port of New York and New Jersey as their first call, an efficient rail system can deliver cargo to an inland destination before the vessel reaches the next U.S. port, making our port a far more attractive destination for shippers,” said Port Authority Chairman Kevin O’Toole. Real estate research firm Jones Lang LaSalle (JLL) stated that inland hubs such as Kansas City, Chicago, Memphis and Eastern Pennsylvania are benefitting from enhanced rail service from major U.S. seaports. Out of New Jersey, Norfolk Southern offers double-stacked container service to its Landers terminal in Chicago and its Atlanta Inman domestic terminal, JLL stated.